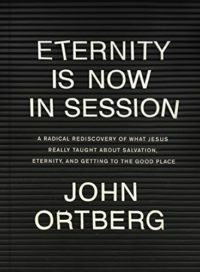 John Ortberg recently wrote a book titled Eternity is Now in Session. In the book he talks about how we discuss, even disagree about, what it takes to get into the group of people who will go to heaven when they die. Most Christians agree that we must believe in Jesus. We must think rightly about Jesus. For many, right thinking about Jesus or belief in Jesus seems to be the only requirement. When we believe in him for our salvation, we are saved. Everyone who believes is “in” and everyone else is “out.” Belief is our boundary. Ortberg called this a bounded set: a group of things defined by a boundary. Either a person is in the group or they’re not. It’s as if Christianity was a region with fence around it. Those who believed a certain way were in no matter how they act and those who fail to believe that way are out, now matter how they act. The opposite of a bounded set would be a centered set: or a group of objects with a common center. In this arrangement, Christians are those who follow and move toward Jesus no matter how close they might be in proximity to him. If you follow and move toward Jesus, you’re “in” and if you don’t, you aren’t. Some people may be closer to Jesus, but, because they aren’t actively moving toward him or following him, they aren’t really his people. Others who may be very distant from Jesus, yet they follow him and move toward him are in. Early in Jesus ministry, he told Nicodemus, a spiritual leader in Israel, “And as Moses lifted up the serpent in the wilderness, so must the Son of Man be lifted up, that whoever believes in him may have eternal life.” John 3:14-15. When we look to Jesus for our salvation, we prove our belief. Does our belief only count when we die? No. Eternity is now in session. It began before the world began and it will exist after it. But when we look to Jesus, we begin to live our eternal life. As we do what he says, we experience that eternal life now. Do I know where to draw the line? Absolutely not. But I don’t have to either. Would you like to draw nearer to God? Follower of One would like to help. We exist to help people move closer to Jesus. Often, that means doing what Jesus says we should do in the Bible. My problem arises because I know more than I do. I often fall short (Romans 3:23) of the belief I claim. I’m probably not the only one with that problem, either. So let’s help each other move closer to Jesus. We don’t have to worry about who is “in” or who is “out.” We can leave that up to God.